Cycling infrastructure should be high quality, consistent and appropriate. Cycling should be fully integrated into the public transport system. On-road cycling training courses should be provided free of charge for adults. Residential areas should have a default speed limit of 20mph. Campaigns to promote cycling from A to B should be bold, sustained and targeted. While, I don’t disagree with the above points, I do have a bit of a problem with the emphasis on cycle training, which misses something key to cycling in the city as it is at the moment. While I think that cycling training is great and important for all cyclists, it doesn’t change the behaviour of the drivers of other vehicles. Being a better cyclist won’t protect you from a car breaking the speed limit, running the red light, or passing you with merely millimetres to spare. Until there are separate cycling lanes across the city, all cyclists currently have to share the road with cars, buses and taxis, many of whom don’t know how to share the roads with us. So I’ve been thinking about what would improve life for me on the roads, and come up with own mini manifesto. I’d start by training bus and taxi drivers. It’s not that they’re the worst offenders, but it would make sense to require them to have a special licence which would be dependent on them having attended “share the road” training. Such training should include speed awareness training, a highway code refresher (and exam!) and a practical during which they are required to travel their usual route or routes on a bicycle (preferably at rush hour or during the school run). Another of my manifesto proposals is for better enforcement of the rules of the road. This would include fines for speeding (requiring the installation of speed cameras across the city), fines for stopping in the green box at lights, and, perhaps most radically, fines for jumping red lights. The latter fine would apply to all vehicles (including bikes), but rates would be proportional to the vehicle size and amount of damage the vehicle would inflict on a pedestrian should it be hit. Naturally, the implementation of this would be costly and identification of the cyclists wouldn’t be as easy as that of cars, but I believe that the amount of money initially raised by such fines (at least until people started to actually obey the rules of the road!) would recoup all those costs. Excess profits would go towards proper cycling infrastructure. Drivers caught breaking the law would also be required to attend “share the road training”. All city counsellors working on cycling issues are required to cycle into work themselves at least twice a week. They should also be required to try cycling on the busiest roads and those with the worst surfaces, particularly Moss Lane West (hint hint). Any driver found parking in a cycling lane would have their vehicle confiscated and replaced with a bicycle of their choosing. Drivers of huge cars who have no spatial awareness should also be required to attend special ‘share the road’ training aimed at oversize cars/SUVs. If there is no improvement to their ability to share the road then their car should be taken away from them and replaced with a bicycle and trailer for their kids. I think I’d better stop now before I get carried away. 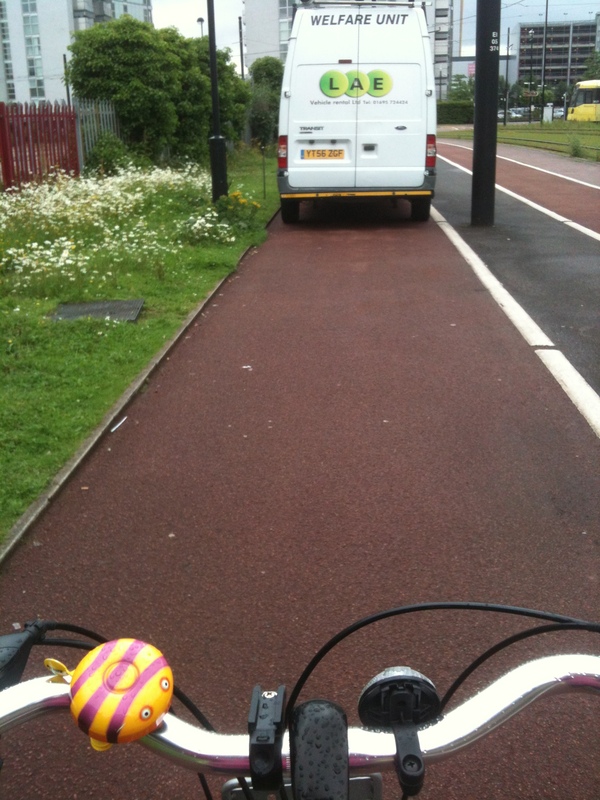 What’s the point in separate cycle lanes if vans are parked right in them? I am a writer, researcher and consultant with over 14 years experience of writing about ethical and environmental issues. I specialise in writing copy for NGOs, charities, social enterprises and the co-operative movement. This entry was posted in Cycling and tagged cycling and Manchester, Greater Manchester Cycling Campaign. Bookmark the permalink. The benefit of cycle training comes when you realise that you can affect people interaction with you on the road by simple changes in your behaviour. Too many untrained, beginner cyclists undertake and cycle in the gutter. By using principles taught in basic cycle training such as primary and secondary positioning, you can become part of the traffic and most of the time, drivers will treat you accordingly.